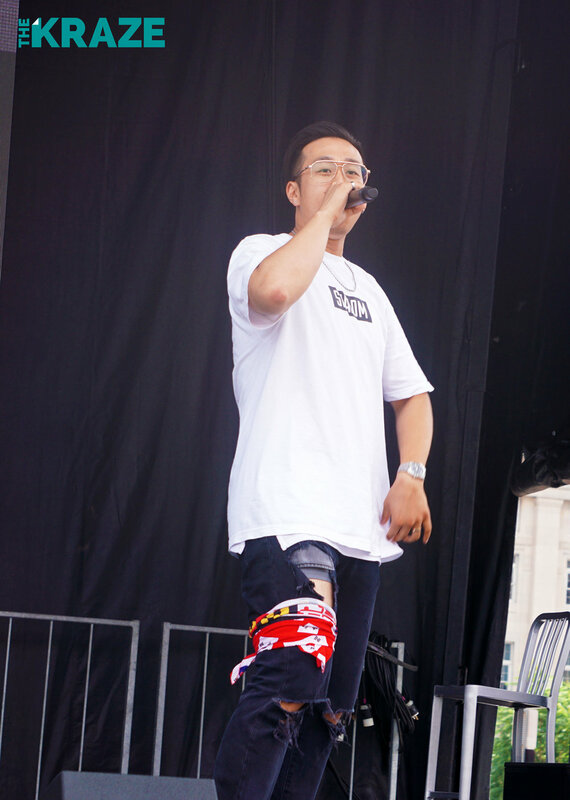 James Han, better known by his stage name Uzuhan, is a Korean-American rapper born and raised in Maryland. Though a lesser-known name in the music industry, Uzuhan has already attracted a big enough audience to conduct tours in Japan and Korea. Before performing on the KCON NY stage, he took a few moments to speak with The Kraze on his career and views on the rise of Korean-focused music. 1. For our readers getting the chance to know you for the first time, can you give a little introduction about yourself? A: Sure, my name is Uzuhan. I’m a Korean-American hip-hop artist from Atlanta. I got my start in Maryland, that’s where I was born and raised. But [I] moved to Atlanta to pursue music full time, [and have] been going to Korea back and forth for the past five years. 2. What was your main inspiration to follow the path of becoming a musician? A: Well actually, for me, growing up in Maryland there weren’t that many artists so I kinda grew up not thinking I would ever do music. I just really was passionate about it, and kept it to myself. I always dealt with a lot of stuff, so me actually pursuing it after this was kind of against my nature and what I grew up around. I was very passionate about music and I see that it creates culture, I see that it can be a tastemaker and an influence [and make] people feel good. 3. How do you feel about performing on the KCON stage this year? A: I’m excited. I have little expectation because this is my first time here so I’m not sure what it’s going to be like. But I’m excited to be here, I mean, standing right here I feel the energy of everything and it’s very exciting. I’m looking forward to meeting all the artists, the fans, and the listeners. There’s a lot of cool people here. 4. What are your thoughts on the growing impact of Korean musicians on the global music scene? A: Oh, I think it’s great. I love it. I think for me being a Korean-American, with the diaspora, I think it really helps people who are like, outside of my circles to really like embrace and be open to my music. In Atlanta, I go to a lot of places that aren’t used to seeing a Korean guy rap, you know, they might have a few examples here and there, but I’m still more or less a novelty. Not even in a mean way, it’s just what it is. So, with Korean music becoming such a global phenomenon I think it allows people to understand the nuance of who I am and really listen to my art, not just see me as “some Korean rapper oh my god.” They actually see what I’m trying to say into the culture. 5. Are there any K-Pop or K-Hip Hop artists that stand out to you? A: Yeah, plenty. I like DPR Live. I think [with] the aesthetic that he has, he’s able to add a lot of musicality, a lot of melody that historically a lot of rappers are not always known to do. I’m not saying that they don’t, I grew up listening to Drunken Tiger so I was very inspired by him. But like, right now DPR he just—when I listen to his music I’m very inspired, I love his visuals, I love everything that he’s doing. He’s super dope. And someone like DEAN, I’m a big fan of. I also like Zion.T. So it’s a lot of the solo artists that I’m a big fan of. 6. Do you have any special message you would like to relay to your Uzugang? A: Well, you know for me, I’ve been doing this hip-hop thing for a little bit, and I’m just very grateful for anybody who supports me at this stage of my career, you know a lot of things are going on, a lot of things don’t happen, it’s always so crazy but to have people that are offering their time to listen to what I have to say. You know it’s very humbling, and even me being at KCON it’s very cool ‘cause in Hip-Hop I have a bunch of audiences but the audience that’s really been showing me a lot of love, a lot of passion, a lot of generosity and support are the people who listen to Korean music or K-Pop or with the culture, they are the people who are really able to lift my spirits up. So for anybody who has given my music a chance, I appreciate you. 7. Last question: are there any upcoming updates, information, or future plans that you would like to tell the readers about? A: Sure, my song with PH-1 is coming out next week, next Friday, June 29. It’s PH-1 and Sam Lock. I haven’t told anybody this. And I have a few other releases with some American artists that are coming out in September. But those are kind of the things that are just happening. Thank you once again to Uzuhan for taking the time to chat with us! Be sure to follow him on social media and check out his newest release, “Fila”!